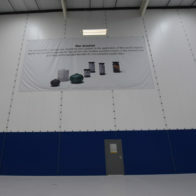 The company needed to segregate between production and storage, for BRC purposes and dust control, at their facility in Seaham, County Durham. Flexiwall’s unique v-overlap system and dust tight seal is an ideal solution for meeting BRC hygiene standards and so was the perfect product to use for this project. Westgate supplied and installed a Flexiwall run along the apex 84m wide x 14m high, which was hung from extra support steelwork. Then another Flexiwall run was installed, 27m wide x 14m (maximum) high, with a foam infill above and down the sides. This provided a dust tight seal, fulfilling BRC requirements. 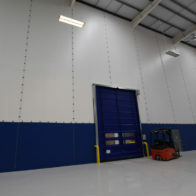 The Flexiwall was coloured blue up to 2.7m from which point the partition was white. This was to colour match with the corporate branding, getting as close to the company’s RAL code as possible. One of the benefits of the Flexiwall solution is that logos and other branding can be printed directly on to Flexiwall or on removable panels. For this project, a printed logo 10m wide x 5m high was printed onto the Flexiwall. 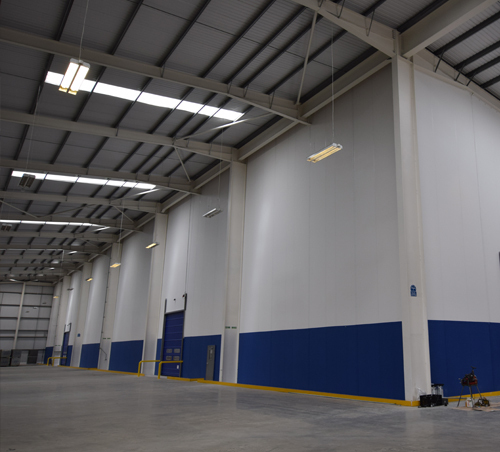 As well as two Flexiwall partitions, three Fastflex fast action doors and frames 4m wide x 4.5m high with radar sensor activation were also installed for fast, unrestricted access. Four pedestrian doors were also installed.The whole installation was completed within 10 days. This fast turnaround time is one of the key benefits of using a Flexiwall system.